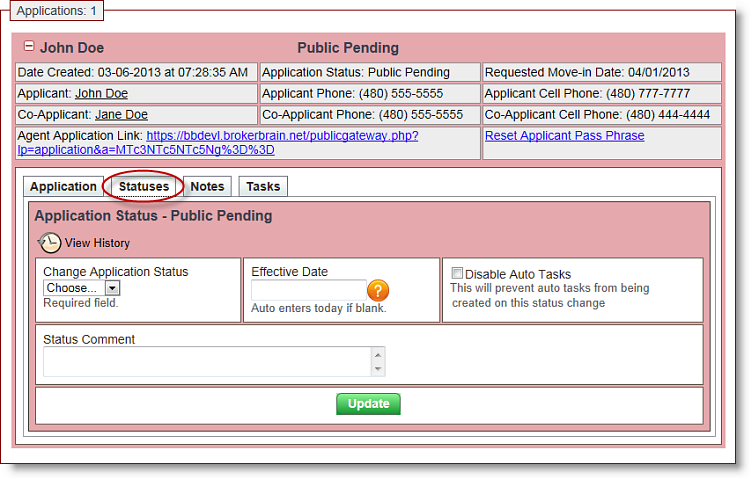 When a lease application is submitted from a public website, it will bear a status of Public Pending, and will display in red, as shown in the screen shot below. In order to indicate that the application has been received, approved, or otherwise, the status must be changed. This is done from the Lease Apps>Statuses tab. There are five default lease application statuses that can be assigned to an application: received, accepted, rejected, withdrawn, or cancelled. Additional statuses can be created as desired from the Admin>Statuses section. For more information, click here. 1. From the desired property, select the Lease Apps sub tab at left. A screen similar to the one below will appear. 2. In the right pane, you will see all of the applications submitted on the property, with each applicant's name appearing as a header. If needed, click the + adjacent to an applicant's name to expand the information. 3. To change the application status, click the Statuses sub tab, shown circled above. 4. In the Change Application Status field, click the drop down arrow. Select the new status. 5. If the status change occurred a date other than today, enter the date in the Effective Date field. 6. If you wish to disable any auto tasks that might trigger based on the status change, enable the Disable Auto Tasks checkbox. 7. Add any desired comments in the Status Comment field. 8. Click the green Update button at the bottom of the screen.